malaikat and Devils. Notice that Kaoru's an malaikat and Hikarus a devil proving they are different!^w^. 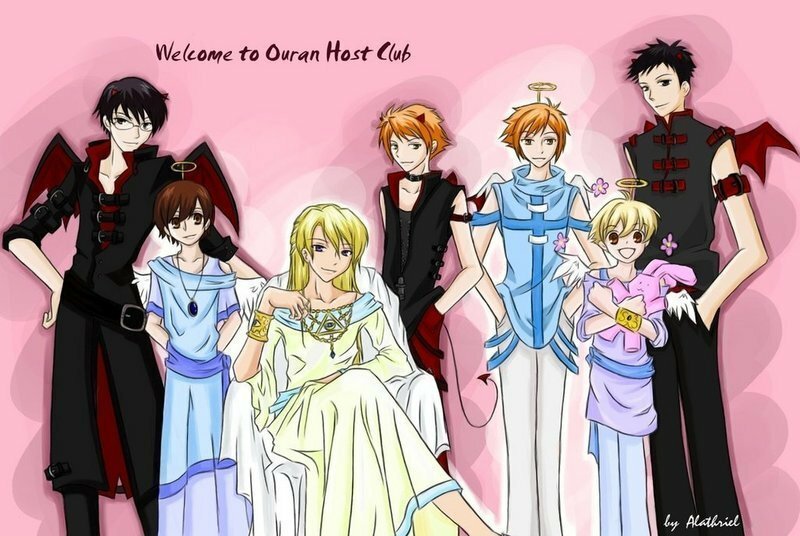 HD Wallpaper and background images in the ouran high school host club club tagged: ouran high school host club tamaki twins haruhi kyoya mori honey. OH MY TAMA! oMG he looks amazing ! * i freeze cuz he is pulling me towards him"
Tamaki"yes my queen?" i Faint onkly to here Tama banish Haruhi to the devyls! tama is strokeing my cheekl apparentlly someone cut there fingre and igot blood on me and fainted! XD lmfao, this is a great picture :D I love how the HC always cosplays :D they're like me ^^;! BTW, The pic. is cool! Woah! Tamaki-senpai's an ANGEL? Are you guys sure? Haruhi: she lookz soo preety! there is nothing better than seeing a bunch of guys and if they r bad or good now before dating them!!!!!!!!!!!! kyoya looks so hot. so does mori.